Opera Co-Pro is the first global marketplace to trade opera productions and to launch co-production projects for funding matching partners. Opera Co Pro is the first global platform of its kind, without geographical boundaries and available in many languages. 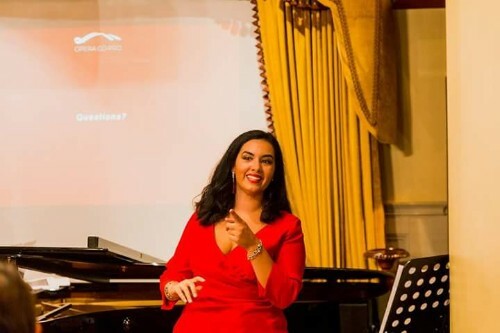 Founder Ambra Sorrentino was inspired by the Airbnb and Booking.com concepts that brought different groups of the same type together and thought there was an opportunity to apply the same model to help opera companies. The company was started in May 2017 with the platform formally launching on 29th September 2017. Networking to Success; How to Use the Media to Boost Your Business; and Sales Teaching and Skills – Introduction. Her business mentor was Jo Sealy. Opera Co Pro has had a spectacular start – with more than triple the number of expected initial clients in less than 12 months, together with five times more productions joining the company’s network. Ambra has some challenging targets that she has set herself over the next 12 months. She has already achieved one of these - to close a major technology partnership with a software company that raises the bar for the future services that Opera Co Pro will offer its members.